Dog hit by van in police chase comes through surgery "like a rock star"
LOS ANGELES -- Gordo, the dog struck by a vehicle during a high-speed chase in South Los Angeles, came through surgery to repair his badly-damaged leg "like a rock star," a doctor said Thursday. CBS Los Angeles reported that Gordo underwent the expensive surgery to see if one of his back legs could be saved. The wild police chase began around 8:30 p.m. Wednesday in South LA. Two suspects in a stolen van led authorities through city streets before eventually hitting the 1-year-old Poodle mix, around 9 p.m.
One of Gordo's hind legs was injured, but the white puppy managed to make his way back to his owner's front door, yelping to come in. The dog was rushed to the City of Angels Veterinary Hospital in Culver City for treatment. "He has a fractured hip and the top of his femur is fractured as well, and there's a deep muscle laceration running up the back of his leg," veterinarian Erich Stumpp said Thursday afternoon. "I have to be honest, I don't know if he's going to be able to keep that right leg or not, but we're going to have surgery to evaluate him this morning," Stumpp said. "There's a lot of three-legged dogs out there that do just fine." By 4 p.m., Gordo was still in surgery. Within minutes of the incident, Gordo he became a trending topic on Twitter, CBS News correspondent Lee Cowan reported. His hashtag, #savethewhitedog, even beat out the Los Angeles Angels winning the American League West. Doctors told KCAL9's Kristine Lazar that they ultimately believed they could save the leg. KCAL9's Serene Branson picked up the story Thursday evening following Gordo's two-hour operation. 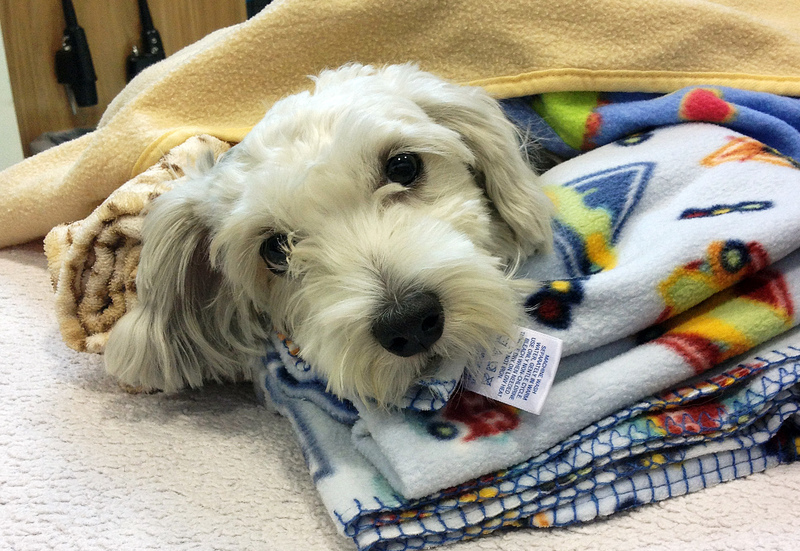 "Gordo is a doing wonderfully," said Dr. Annie Lo, "he was a rock star under anesthesia." The doctor also told Branson that Gordo is lucky to be alive and has a long road ahead. Dr. Lo helped perform the operation to repair his broken hip joint and pelvis. "What we did was remove the ball portion of the joint," Dr. Lo said, "so a false joint can form and have scar tissue like it was normal." To donate toward Gordo's medical bills, click here. Staffers at the hospital told Branson that if there is money left over after Gordo's surgery, donors will have the option of getting a refund or donating the remainder to the Culver City's K-9 unit. The two suspects inside the van, Yovany Ervin Rodriguez, 21, and Gwendi Yarubi Valenton, 26, were arrested and booked on suspicion of unlawful taking of a vehicle.